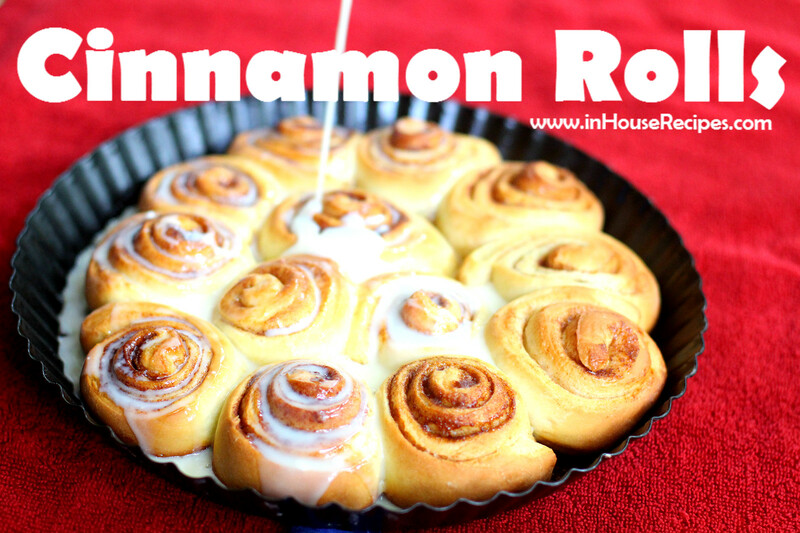 Cinnamon Rolls is an exotic dish mostly found in western countries. It is damn good and tasty and it is my best that if you eat one, you will get addicted to it. 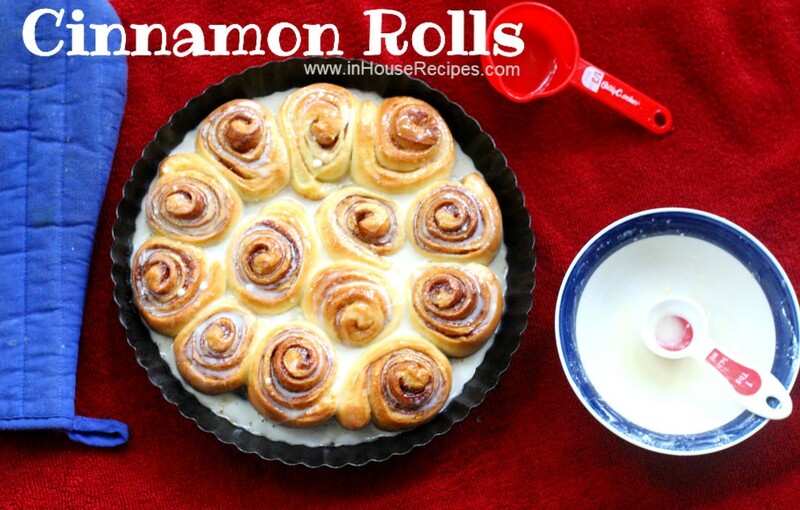 The one we are showcasing today is the recipe for Glazed Cinnamon Rolls; meaning that they have a topping of the Sugar syrup. 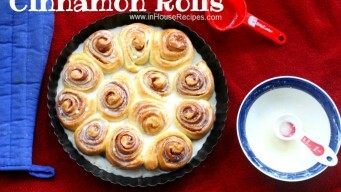 You can certainly eat these rolls without this glaze but you won't be able to get the real taste. It might feel a bit rough and dry without the glaze. This is a tried and tested recipe from inHouseRecipes's kitchen and we hope that you will love it. 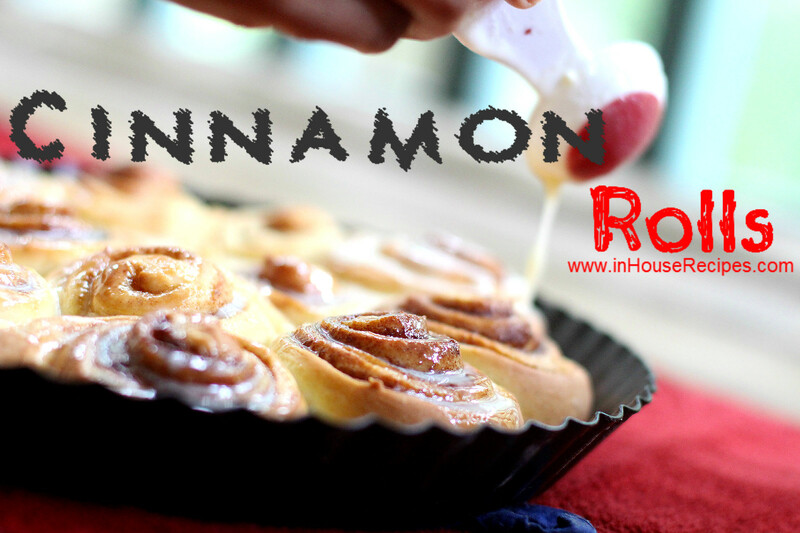 The video this time is a bit longer than usual partly because of a bit extended process for making Cinnamon rolls and partly due to the kind of details we like to share for each ingredient and the steps. The whole recipe and its ingredients have been divided into 3 steps and parts to make it easier to follow. 1/4 tsp Vanilla Essence 1.5 tbsp Cream-Cheese Or Milk Cream – Called Malai in Hindi 3 tbsp milk 1/2 cup Powder Sugar Or Normal Sugar can be grind to finer Sugar and used here. 1 tbsp Butter Unsalted Salted or unsalted. Unsalted is recommended. Warm up the water and add 1 tsp Sugar (we will use the left-over sugar later) along with dry Yeast, in a bowl, big enough to hold it. Let it sit aside for 2 minutes. Melt butter in another bowl (you can use Microwave for 30 seconds) or melt it on stove. Add rest of the Sugar (left over from step above), warm milk , Salt, vanilla essence and mix well. We need to add the Egg White. Break the Egg and filter out the Yolk using the half broken Egg shells. Add this Egg yolk in butter mixture and mix well. Add this butter mixture to All-purpose-flour. Use a Sieve to filter out any small unwanted particles from the egg. Now, add Yeast water (from step 1) and then knead it to make a smooth dough. Take a bowl and grease its inner walls with 1 Tbsp Oil. Use this same oil to grease the Dough outer layer as well. Cover this bowl with lid and keep it in a warm place for fermentation for 1 hour. To make use of this 1 hour, lets move ahead with nest step. Mix all 3 ingredients except Butter. This butter will be used separately with Dough later. After an hour, Dough would have fermented. You can see that it has fluffed a lot. Sprinkle some dry All-purpose-flour on desk and roll the fermented dough. Use a rolling pin here. Roll it into a square shaped flat-bread with a thickness of about 1 inch. Once done, grease its surface with melted butter from step 2 ingredients. You can either use your hand or a brush. 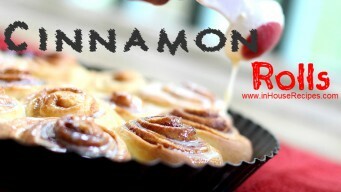 Now add a layer of Cinnamon mixture (made with step 2 ingredients). Leave 1 inch space at all the corners vacant. Now, roll this flat-bread to give it a cylindrical shape. Press the last patch’s corners to make them stick with the body. Now, take a baking tray and grease it with Butter. You can also use butter paper here if you do not want to grease with Butter. Divide the whole log into 1.5 inches long pieces and place them in baking tray adjacent to each other. Baking tray is ready. But, we need to keep them again for 1 hour for some more fermentation before actual baking. After this 1 hour, you can see that rolls have fluffed a lot again. They almost look like they are ready. Total fermentation time was 2 hours (1 hour for dough and 1 hour for the rolls). They are now ready for baking. Pre-heat the Oven on 350 F (180 C) for 3 minutes and then bake rolls for 30 minutes on same temperature. You can also use Microwave Oven (Also known as Microwave with Convection mode). Add 1 Tbsp melted butter on top of the rolls just before adding them to Oven for baking. Lets complete our next step until rolls bake. Melt the butter and add warm milk to it. Add Cream cheese, Vanilla essence and Sugar. Mix them well to remove lumps and have dropping consistency. After 1/2 hour of baking, take out the rolls. 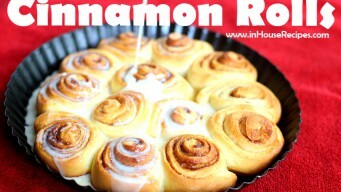 Pour the Glaze on top of all Cinnamon rolls.